The accumulation of condensation will occur when water comes into contact with a colder surface than the surrounding temperature. The water may take the form of actual drops of water or frost. A garage door must move freely on all 4 sides in order to open. A garage door is made up of 4 sections, thus 5 areas as well as the sides of the door will allow air to enter. The size of a garage door (9'-16' wide) does not compare to that of entry door (34”). The surface area can easily be 4 to 5 times that of an entry door, and therefore presents a larger surface to cooling. A garage holds more humidity than the entryway of a house: snow and ice stuck to a car, fire wood being stored, poor or no ventilation, etc. on the aluminum U-bar (if applicable), on the bottom section of the door. exterior perimeter double-lip weatherstripping, higher efficiency than regular weatherstripping, is recommended to stop the air infiltration. Lastly, excess humidity in your garage can be eliminated by leaving the garage door open for a few minutes; cold air will quickly fill the garage, thus lowering humidity. 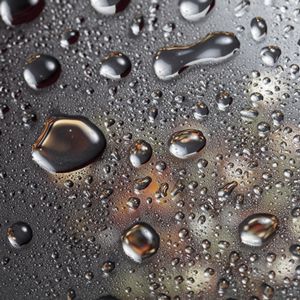 Use a dehumidifier if you have one, especially in the case of newly-built garage. GARAGA garage doors are very high quality products. Please do not hesitate to contact your Garaga dealer for solutions to any problem that may occur or if you have any general questions. WARNING: It is not recommended to “crush” the weatherstripping against the door as it will prevent smooth operation of the door. For a smooth operation of the weatherstripping, we recommend the use of a silicon-based lubricant. Do not use any petroleum-based oils.